Have you ever wondered why high performers like Sir Richard Branson, Bill Gates and others, left school as soon as possible or dropped out of University? The tragedy is you are incredibly bright. Yet from early days those around you who guided your development had no idea of these things so you learnt the habit of thinking behaviours that constantly underperform. You are intelligent so you have noticed it, you know it but you just do not understand why. The weakness in normal Best Intentions and Effort performance, is the thinking is limited by stress, stresses, stressors, unseen mental stumbling blocks and much more. These mind processes hamper, indeed muddy clear thinking with fake beliefs it is clear thinking. Why are many immensely successful entrepreneurs lacking any higher education qualifications as you have? Why is it that many high performers are dyslexic? The answers to the above questions are very similar with only slight differences. The Neuro-faultProtection sustainable high performance program of training and coaching is the result of over twenty years of studying the above questions and then formulating thinking strategies that replicate sustained high performers. The answer is these and well qualified high performers think in a different way from the vast majority, sufficient to make a marked difference in their capability to out-perform their peers. Those high performers lacking paper qualifications do this naturally, which gives them an urge to go out in the world and do what others just do not see or understand. Those high performers with high qualifications have learnt the skills of thinking with what is essentially a different part of their brain or using their brain in a different way. They have learnt to use their subconscious brain that works, better, faster and has automatic access to a field of guided information lesser mortals have not learnt to use more than on relatively rare occasions by accident. Without going through a three or four year intensive management training, Neuro-faultProtection will train and coach you in the specifics of sustained high performance creative thinking in hours not years. Have you noticed how these high performers also appear relaxed and spend more time enjoying life with their family and friends. During the years of research into sustained high performance Robert Denton discovered there is no stress, stresses or stressors in this specialised form of thinking. 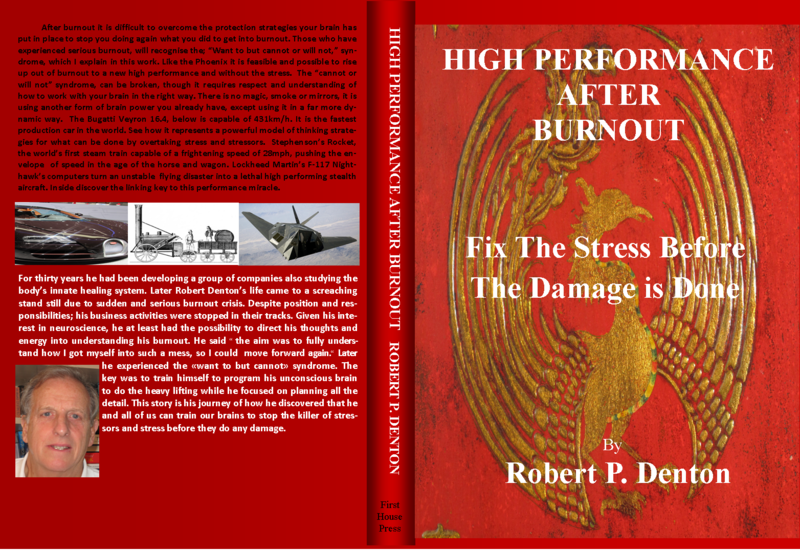 It is all in Robert P. Denton’s new book ‘High Performance after Burnout’ ISBN 9781512294705 is available direct in person or by post from neurofaultprotection@gmail.com – at www.amazon.com or order from your local book store. How your thinking processes work. How high performers do that. How you can do that too. A little stress activates performance. High Stress kills performance.